6th and Final Mudroom Build…for now. I know those that follow this little diddy might think that I pooped out on this little renovation project. Au contraire my friends. I’ve been working like a maniac to get some things buttoned up for the winter. You’ll see in some of the following posts. One thing I have yet to do is rent the 24′ box truck to drive up to Shoals Indiana and pick up 10,000 pounds of Indiana limestone to jazz up a couple of walls on this place. I didn’t tell you that? Oh, I’m stripping all of the aluminum siding off the house and putting up cement siding and limestone. Crazy? You bet. Why, here’s a little sneak peak – to let you know I haven’t become a slacker. Now where were we – oh, the Mudroom. Here we are ready for the new counters. Everything is finally in place. Last time that sink base comes out. Here’s the start of the counter install. 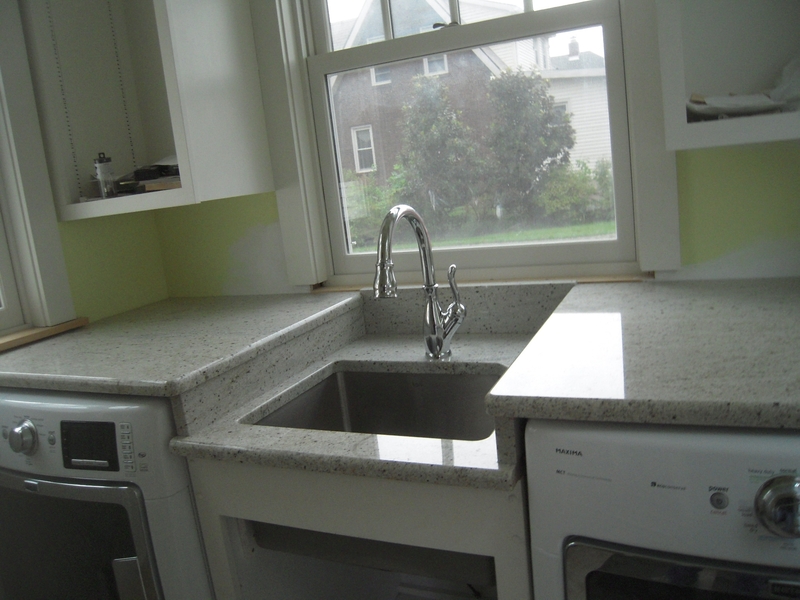 I chose a white cashmere granite. It picks up the tones in the floor and works well with the wall colors. The wood supports for the counters are screwed to the studs behind and on the sides of the appliances. I used a laser level to get a good straight line for the supports. Here are the workers from Cutting Edge Granite. Gerald Embry over there is great to work with. These guys fabricated the sink cut out twice. I was not aware that undermount sinks usually leave the lip of the sink exposed under the counter. I didn’t like this, and they cut another smaller opening for the sink for no additional charge. 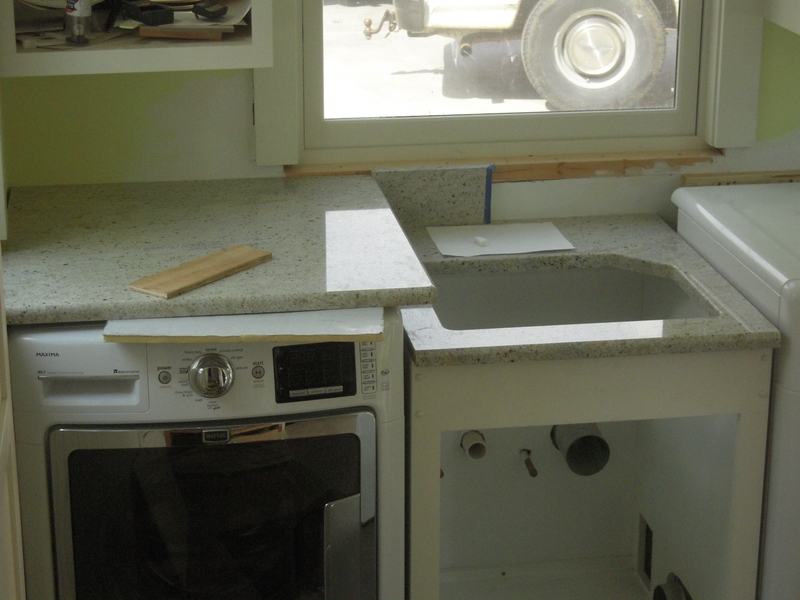 Here the counters are in place. The sink base front is painted ceiling white – it looks a little peach against the bright white appliances. I’ll paint it white when I finish the doors. Here’s the Delta Leyland Faucet added. 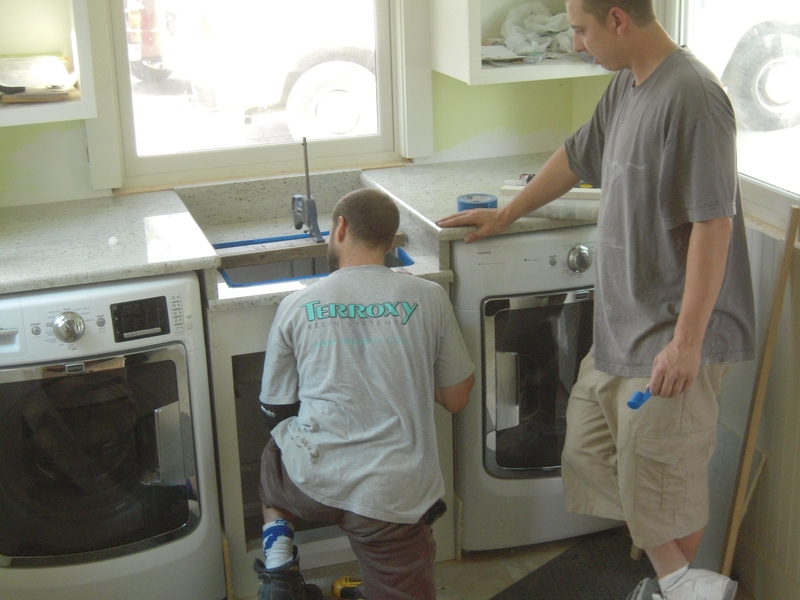 I wanted to drop the sink top down to a normal level of 36″, as the tops of the washer and dryer are 40″ from the floor. This was just too tall for my wife to use and I didn’t want to have to integrate a step drawer in the bottom of the sink cabinet. Here’s a close up of the sink, faucet, soap dispenser and fiber optic garbage disposal switch. I went with the fiber optic switch because of the simple interface and the fact that one touch lets the disposer run for twenty seconds and then automatically shuts off. 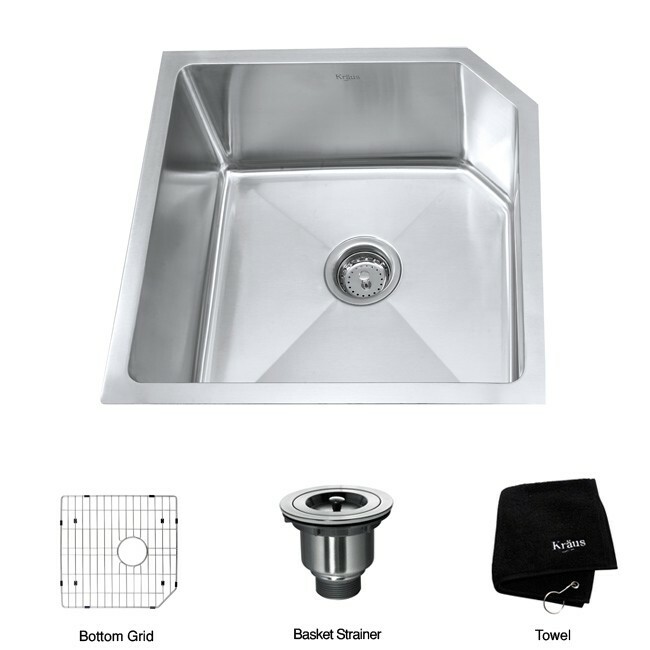 This is a Kraus 23″ Sink This is a 16 gauge stainless steel sink. Remember the larger the number the thinner the metal, so many sinks are now made 20 gauge, so this dude is very, very sturdy. It’s 10″ deep, so it has some room. I didn’t go with a really deep laundry sink because I think my wife will use this to clean garden vegetables more than she will use it for laundry. Using the 10″ sink allowed me to add the garbage disposal, so when she cuts roots and pre-preps the vegetables the disposal will come in handy. OK – we’ll leave this mudroom for awhile. We’ll revisit when I have time to make the doors for the upper and sink cabinets. 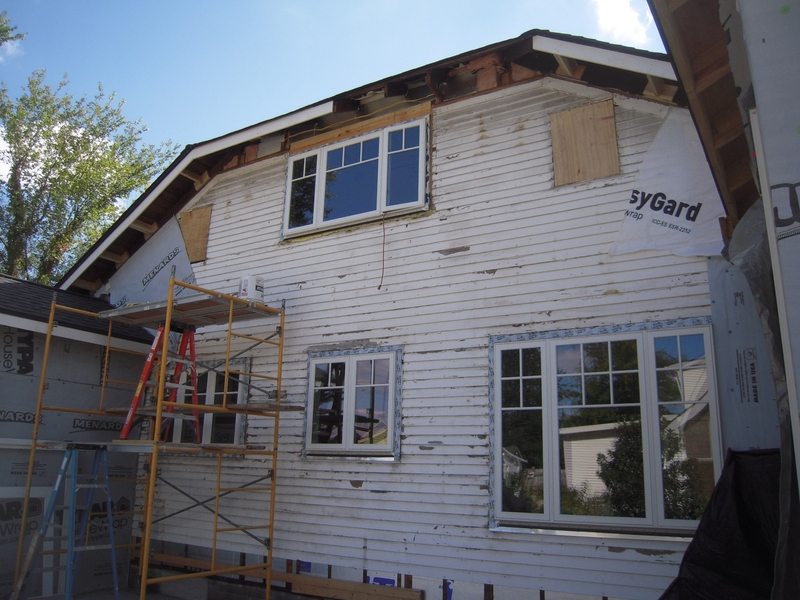 But we still have that sunroom foundation drama to cover – so that’s up next.Then there’s building the sunroom – adding 250 pound windows, a interior stair tear out and rebuild. A master bath, closet, and bedroom renovation. A full exterior renovation including that limestone previously mentioned.And some other stuff. Gee, I hope all of you are still alive by the time I finish these posts. 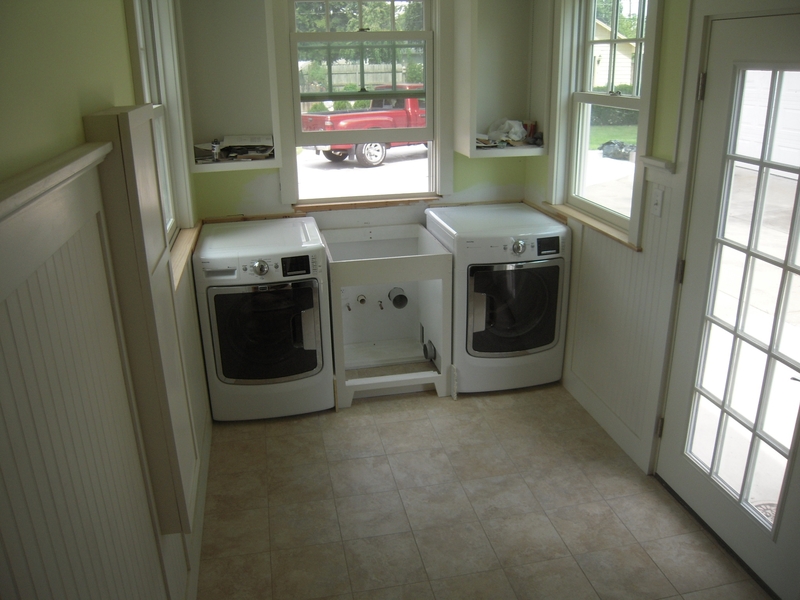 This entry was posted in Mudroom, Room Addition and tagged 1930's bungalow, diy, fiber optic garbage disposal, granite laundry counter, kraus sink, leyland faucet, Old Home Renovation by curt. Bookmark the permalink. Thanks Sophie – I can’t wait to get to the upstairs where you’ll see you inspired me. Thanks guys – I have yet to find a stray critter in there yet. Your groundhog post was priceless. I thought you might be doing a lot of things… but no way I thought you abandoned this project. Although I admit it didn’t occur to me you’d be ripping off all your siding! 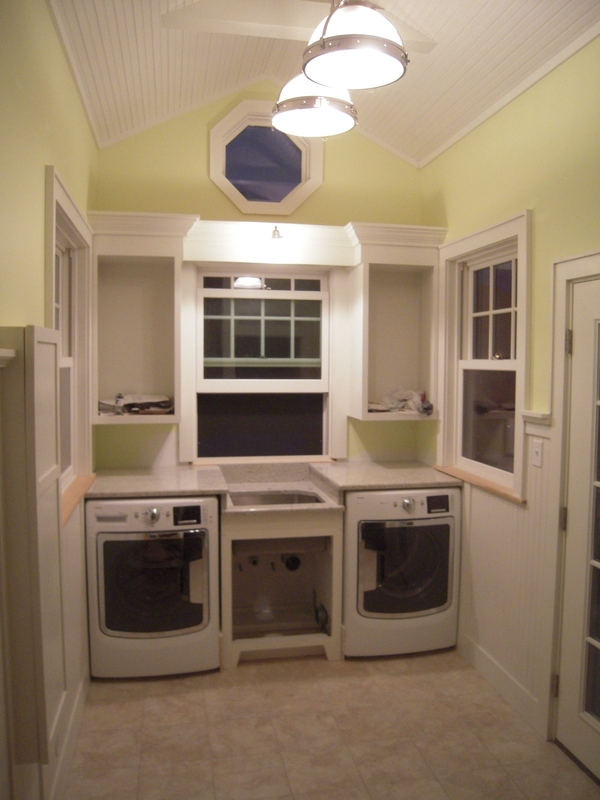 I love your laundry room. Everything about it is fantastic. I even love the faucet you chose (although maybe your wife had something to do with that). You really did a beautiful job. Can’t wait to see your sun room!!! VE – unfortunately I don’t have a magic wand to wave – and if I did I’d have no one who would respond. So juggling multiple projects is par for the course. Thanks for the thumbs up. It will be a while before the doors are made. I picked the faucet – she’s not much on the selection process. I pick stuff out I like, then show her – if she says no, then I go pick something else out. Works pretty well! Thanks Diane! I think it will be quite a while before I get fancy kitchen cabinets like you. Beautiful kitchen. What a beautiful space! User friendly layout is so important in a mudroom. Thanks Kim – I only worry about stray shoes being left in awkward places. Thanks for stopping in! Thanks so much! You know 1st hand the wrangling of a renovation. Keep up the good work. Amazing work as usual! 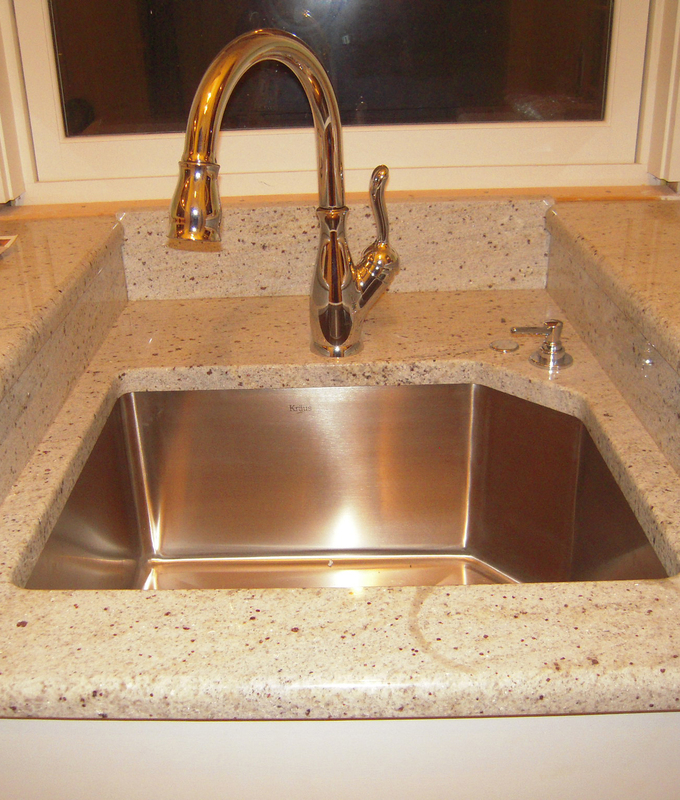 Love the Kraus sink.I got one for my kitchen and LOVE it. One of my favorite parts of our remodel. Hi Stacey! Aren’t those Kraus sinks nice? And not too expensive. Thanks for your kind words. Love it!! It really came together nicely. I cracked up at the 24′ box truck/10,000 lbs of limestone statement. I actually get that (though it’s highly impractical for me to drive to Montana to get our exterior stone, simply from a cost containment perspective). Do write about that adventure (and include pix!). Hi Janet! Since we live in southern Indiana it’s only a couple hours drive to get to the Bedford limestone fields that Indiana is famous for. We’ll keep you posted. you well know that home renovation takes some quirky turns, so the adventure continues. I am not sure whats happening but I been missing your posts. I came here today because I realized I had not heard about your projects in a while. I like how this room is coming together. Everything looks so good. I like the step down for the sink and the shape of the sink. I wasn’t sure about what you were talking about for the garbage disposal…I couldn’t find it….unless you are speaking of that silver dot next to the soap dispenser. How does that work? So is this room the back door transitioning into the house? Is it heated? I think all old houses have them. LOL This one is amazing though. Keep up the good work. Can’t wait to see the limestone project. Hi! Yep the garbage disposal switch is that silver dot. It’s a fiber optic switch, no moving parts – just touch it and it turns the garbage disposal on for 20 seconds and then turns off. This is a room I added where the back door was. I’ll try to post a floor plan of the original house and the new additions. The floor has in floor heat, and also it has regular forced air vents. Yeah that whole project is just awesome. I am amazed. Are you sure your wife isn’t more active in this? LOL just kidding. I love that garbage disposal switch. It does have some kind of safety mechanism in case kids get to playing with it right? Yes post your floor plan…would love to see it. I love this kind of stuff. Hi Ms Jay! Always enjoy your posts. My wife is certainly passive in this project – but that keeps the conflicts to a minimum 🙂 The garbage disposal switch is pretty hard to get to for a little one. Now the bigger kids – well that might be a problem. Floor plan is up – now if it was as easy to build something as it is to draw it on paper I would have been done years ago. Hi there. So happy to have found your blog. Love what you are doing and will watch with interest.